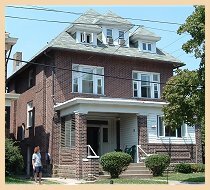 Hasina House CRR located in Squirrel Hill is an all male six bed facility. Residents and staff participate in multiple shared events throughout the year including an exercise group and various holiday parties. At Hasina fifty percent of the residents are employed, in school, or volunteering. Hasina also has a thirty three percent completion rate which have the residents returning to live with family or participating in Supportive Housing and living in their own apartment.